This blog will discuss what voice of the customer is and how it can help your business. As a marketing manager of Microsoft Dynamics CRM value added partner Caltech CRM, I have set out what I feel is important to think about before undertaking a voice of the customer programme. Following this I have used the Microsoft Dynamics CRM voice of the customer software to see how it fits into this strategy and will help your market research efforts! As a digital marketer I hope my tips help you and if you need anything else, please drop me a comment at the end of the blog. 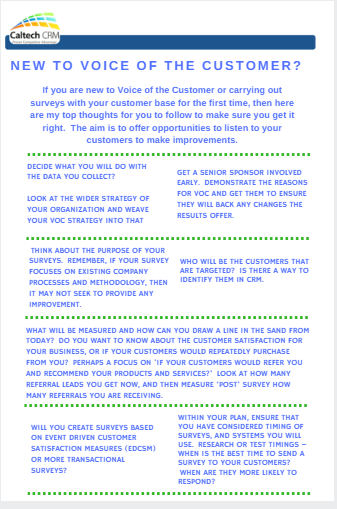 Voice of the customer (VoC) is a market research strategy. It’s a process to find out more about what your customers like, what they don’t like or the way they want to interact and communicate with your business. It can be very powerful offering insight, securely informing you to take your business forward in the direction that the customers need it. In a nutshell, voice of the customer is your customer’s feedback. Voice of the customer can be used for qualitative and quantitative market research. It enables you to understand your customers during their customer journey with your business, offering you ways to respond to them which can produce excitement about your brand and the entire brand experience. In my opinion good voice of the customer research starts with great ethics and must adhere to The Market Research Society Code of Conduct and data protection legislation. It’s a good idea to understand the code before you start your planning. Here is some information you can find out more here. I have found that the most effective VoC strategies are those that create a 2-way communication with customers, as a matter of course. Indeed, a well thought out VoC programme will produce information that you need will help your business to improve, therefore it’s critical that you seek to find what truly matters. Having touch points across your customer journey, involving more than one team, is a great way to use ongoing conversations to capture VoC feedback. Recommendation: map out your customer journey and start thinking about the touchpoints where there is natural communication with your customers. How can you get them to respond at those communication points, without breaking into conversations unnaturally? So for example, you can use the voice of the customer programme to get feedback to find gaps or problems in your service, send offers to generate cross selling, or perhaps to help identify how to alter your products or services to the desires of your customers. There are several types of voice of the customer research, from personal one to one interviews to telephone interviews. As more and more people are transacting digitally with your brand and your business, Online or Digital Surveys can be utilized to give great insights and a wealth of data. Microsoft Dynamics CRM now offers a voice of the customer (VoC) survey feature which we will come onto later in this blog! It is worth remembering that in today’s digital world, customers will want to use engage using both mobile or fixed devices, so you need to ensure you know your audience and that your surveys are usable over different hardware. New to Voice of the Customer? Why voice of the customer is so important? Carrying out VoC questionnaires is so important as you need to create that moment of “wow” in a crowded market-place. As consumers, we pay money for goods and services that we expect to receive correctly and quickly. When a parcel arrives quickly we don’t think, “Wow wasn’t that great”. It’s just met our expectation. Delighting customers and engaging with them so your business can continuously improve is why VoC is so important. My next blog discusses Microsoft Dynamics CRM Voice of the Customer functionality. Check it out and see how it can extend your CRM data to get real time feedback to propel your business and help to make sound decisions.